For additional information about this book, visit the website www.adventureswithjimmy.com . Jimmy doesn’t want to go to school. He’s been in the first grade for a few months now, but he still thinks the huge doors at the entrance to his school are scary. It’s not just the big doors, though, that are making him nervous and a little scared; it’s knowing that as soon as he speaks, the other kids in his class will laugh and make fun of him. Jimmy knows what he wants to say, but sometimes the words come out wrong. Jimmy gets even more nervous and scared when his teacher, Mrs. Lyons, tells the children they will be performing a play for all their friends and families. The play is “The Elves and the Shoemaker” . . .and she casts Jimmy as one of the elves. Mrs. Lyons assures Jimmy that he’ll do just fine. But how will he ever be able to speak in front of an audience? 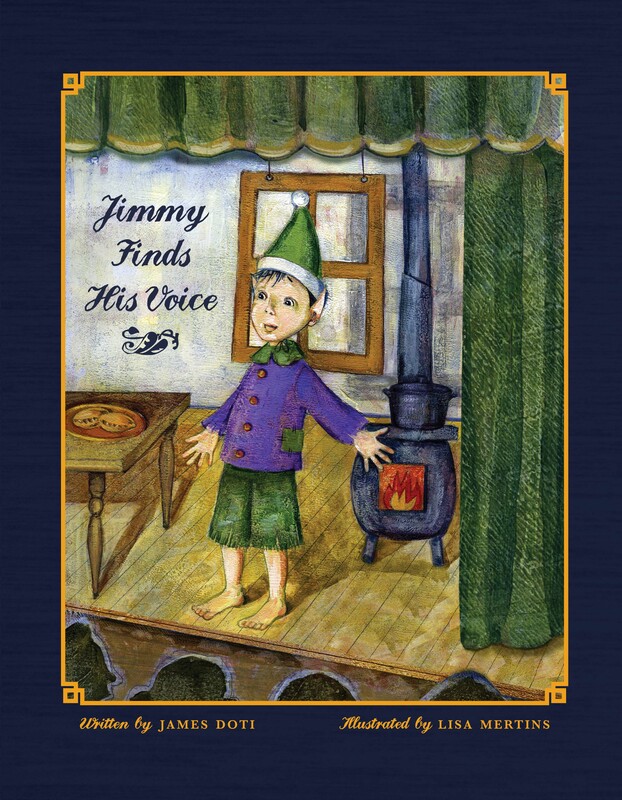 Jimmy Finds His Voice is James Doti’s second book based on his childhood. His positive and caring message, told in his gentle style, will appeal both to children and to the adults who read to them. Lisa Mertins’ charming and evocative illustrations bring the story to life. The book also includes a recipe for “The Shoemaker’s Wife’s Meat Pies,” so elves at home can enjoy the same treats devoured by the elves in the story. The real treasure, however, is that Jimmy’s experiences are pictured and told in a way that is relevant and heartwarming for today’s generation of kids. In this touching autobiographical picture book, a young boy discovers that enthusiasm can trump his speech impediment. First-grader Jimmy interchanges some of his consonants, so that he doesn’t say his “worbs wight.” Opening with a letter from the author describing his experiences with bullying as a child, this charming tale centers on how he learns to overcome his fear of speaking around his peers. Both his mother and his teacher, Mrs. Lyons, are sympathetic, and they do their best to help Jimmy cope. When Mrs. Lyons tells the students they’ll be performing in a play, Jimmy is horrified; the other kids are sure he won’t be able to manage his lines. Eventually, Mrs. Lyons convinces Jimmy, the earnest young hero, that if he can say his lines with “verve,” his pronunciation won’t get in the way of delivering the message. Once he realizes how delivery can impact how words are heard, he finds the courage to stand on stage and say his lines—and finds himself accepted by his classmates. Doti (A Christmas Adventure in Little Italy, 2010) also includes a recipe for meat pies, as cooked by Jimmy’s nonna. Though the text is lengthy for a first-grade picture book, and there’s a distracting shift from present to past tense as Mrs. Lyons shares the story behind the play, the illustrations by Mertins are wholly appealing. Their soft, watercolor tones capture both Jimmy’s fears and his eventual triumph. In a comforting color palette, Doti’s childhood school is happily depicted as populated by a variety of ethnicities, despite the 1950s era implied by the children’s clothing. Notwithstanding the presence of school bullies, there’s little here that will make readers feel threatened. Although the story doesn’t deal with Jimmy overcoming the teasing, his discovery of self-confidence is a valuable lesson on its own and one that young readers will appreciate. Parents may find this book useful for discussing issues of shyness or speech problems with their own children. A charming story with delightful pictures ideal for reading together. James Doti earned a Ph.D. in economics at the University of Chicago. He has served since 1991 as president of Chapman University, where he also holds the Donald Bren Distinguished Chair of Business and Economics. He is the co-author of two econometrics texts and co-editor of a collection of readings in free enterprise—The Market Economy—that received the Templeton Honor Award for Scholarly Excellence. Jimmy Finds His Voice is his second collaboration with illustrator Lisa Mertins. Their first book, A Christmas Adventure in Little Italy (2010), appeared on Amazon.com’s list of “Best Children’s Holiday Books” and was a Sons of Italy Book Club selection. Lisa Mertins is a career illustrator, having worked on newspaper staffs and as a freelance artist for over 25 years. She has worked on six children's books and has written one herself. She is currently diversified over many art disciplines from printmaking and ceramics to traditional and computer generated illustration. Lisa lives with her family and her animals, including chickens, horses dogs and cats, in Southern California. You can see her work at www.lisamertins.com.